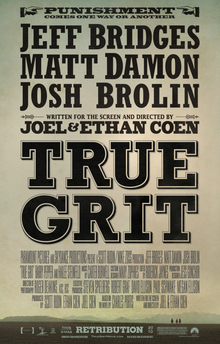 This was my second watch of ‘True Grit’ after seeing it at the cinema when it came out, and whilst I still haven’t seen the original, or read the book so I can’t compare with this, what I can say is that this is an excellent film in almost every way possible. Newcomer Hailee Steinfeld plays Mattie Ross, a girl whose father has just been murdered, and she puts a bounty on the killer’s head, tracking down Rooster Cogburn (Jeff Bridges) to hunt the man down. Accompanied by Ranger Labouef (Matt Damon), they set off to track the killer down. It features many of the hallmarks of classic westerns, with absolutely sublime cinematography and some fantastic musical compositions to accompany key scenes that remind me to an extent of Leone’s masterpieces. This is of course a Coen Brother’s film, and they’ve blended in their unique style of black comedy into the film and it’s a lot funnier than I’d perhaps anticipated. I was surprised at how long it took for Chaney (Josh Brolin) and Ned Pepper (Barry Pepper) to appear but the conclusion was superb with a terrific pay off. The scene witn Cogburn facing off against Pepper and 3 of his men through the view of Labouef and Ross at the top of the cliff is just completely gorgeous. A very good film that reminds us that the western can still be an immensely entertaining genre if approached in the right manner. A further point re the Oscars though, how in god’s name was Hailee Steinfeld nominated for a supporting actress?? She’s blatantly the main actress, she’s possibly in the film more than Jeff Bridges! Anyway, one more film to go on this journey through the Coen Brother’s collection – this year’s ‘Inside Llewyn Davis’, a film I enjoyed a lot when I saw it earlier this year.